If you are experiencing one or more of these symptoms listed, slowly richen the mixture by giving the high speed adjustment 1/16th turns counter-clockwise until the symptoms disappear. Having set the high speed needle correctly, take the RC vehicle and pinch the fuel line going into the carburettor. The engine should run for about 2-3 seconds, speed up, and die. 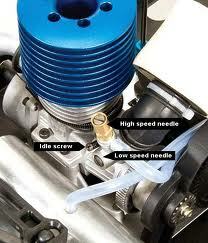 If the engine runs longer than 3 seconds, give the low speed needle a 1/16 turn clockwise. Run the vehicle again and retest. Repeat to get right. This screw is located beneath the oil filter, facing towards the front of the vehicle. The idle speed screw is used to adjust the throttle input when the throttle servo is at idle. This should be set low enough to keep the vehicle from moving at idle, but high enough to keep the engine running. When adjusting the idle speed screw, counter-clockwise closes the carb, lowering idle speed. Clockwise opens it, increasing idle speed. This should be the last thing set up, but if it's obviously too high, there is nothing wrong with adjusting it while tuning. 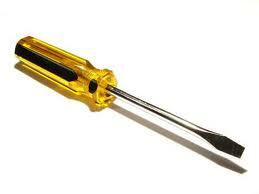 Remember, the goal is to reach the point that is just before the point where the engine stalls and cuts out.